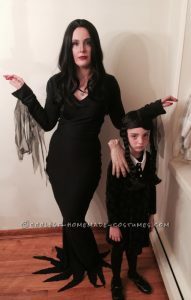 I absolutely love this costume as it’s a great mother and daughter costume. If you’re going with a group of friends, why not expand it to the whole Addams clan? Many of us young adults have grown up watching shows from the Disney Channel. 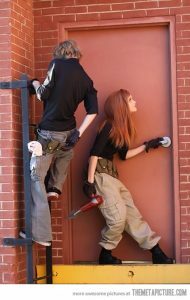 So why not dress from one of our favorite shows, Kim Possible? A black long sleeve top can easily be made into a crop top and the cargo pants can easily be swapped for jeans of a similar color if need be. Now what girl hasn’t wanted a unicorn in her life. Well now you can become one for Halloween. What makes this costume easy is that it can wear any white dress, leotard or outfit you may have. Then you can easily buy or make the horn and tail. I’ve cosplayed Poison Ivy twice in my life, with her costume, you can put any spin on it. You can make her as covered up or as revealing as you want. The main key is to have tons of leaves and that infamous red hair. For me, since I had no sewing skills at the time, I hot glued leaves onto already owned clothes that I wasn’t planning on wearing again. You can become any animal of your choice this Halloween with some cute ears and a makeup that just screams, fawn, cat or even bear. The outfit itself can then be left up to your imagination, do you want to go full animal or do you want a ‘what if this animal wore clothes’ route? This choice is yours. Last year for Halloween I went as an angel. The key to this is in the wings that can be bought at any party store around this time of year. If you want, you can also include a halo to boot. Any white article of clothing will do, from a swimsuit to a long gown. We’re in the age of booming social media and messengers, and one thing you cannot escape is the emoji. 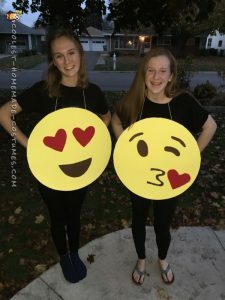 You can do what these friends did and wear a cut out of an emoji. Or you can get a yellow t-shirt and paint on the emoji’s face on it, and then match with a pair of black pants. Super easy and cheap to do. Like the animal costumes, this is all in the makeup. You can an undead spin on any of your clothes by tattering them up. However don’t forget that a lot of the work goes into make you look completely void of life and in need of some brains. This is one costume that I’ve always wanted to do but never got around to it. It’s a witch! Another simple but diverse Halloween costume idea. You can put your own spin on her by making her similar to the green-skin monster of kids’ books. Or even a modern day version that’s a bit more elegant. You can basically make this using just the clothes in your closet and your hat can easily be made using bristol board, painted black. Who doesn’t love some good Starbucks in the morning. 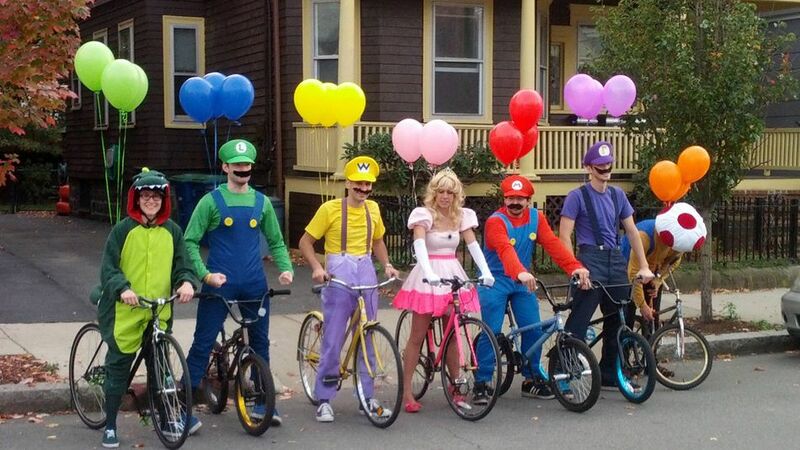 This costume idea can easily be accomplished with any beige outfit and a printout of the Starbucks logo. So what do you all think? 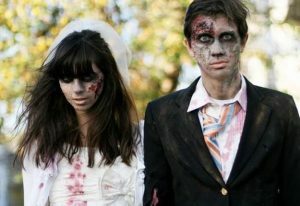 Will you be trying any of these Halloween costume ideas? Leave a comment below and let me know what you’ll be going as this season. During this month, I am trying to feature some Halloween themed posts to prepare you for the spookiest time of the year. 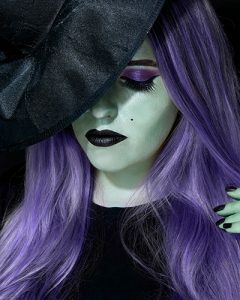 If you haven’t, check out our 8 Gothic Makeup Brands Perfect for Halloween post. Super fun ideas Naomi. I’m usually a witch because I have lots of black clothing and the basic green makeup is easy for me. But I’d like to branch out! 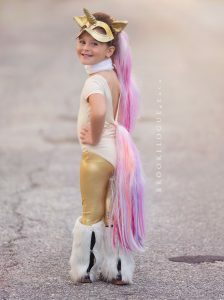 I really love the unicorn idea so cute and fun! I love all of these!! Especially the emojis!! 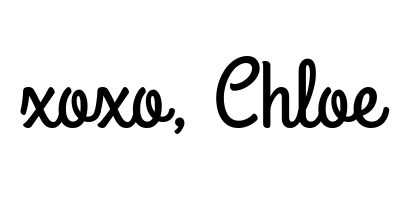 Loved the emoji idea! Like totally cool! Awww, the deer is cute! It reminds me of the snapchat filter, which happens to be my favourite! All of these are great ideas, love the unicorn, too! Great post. I definitely love animal costumes. They’re perfect for all ages. I’m glad you enjoyed my post. So cute! I’ve never seen kim possible listed as an idea and love it! Omg The first pic-Mario Bros is tooooo cute! Really great ideas. I like the make-up on the witch in the last picture. Never thought of doing a witch costume that way. Zombie is always a hit though. Great list. 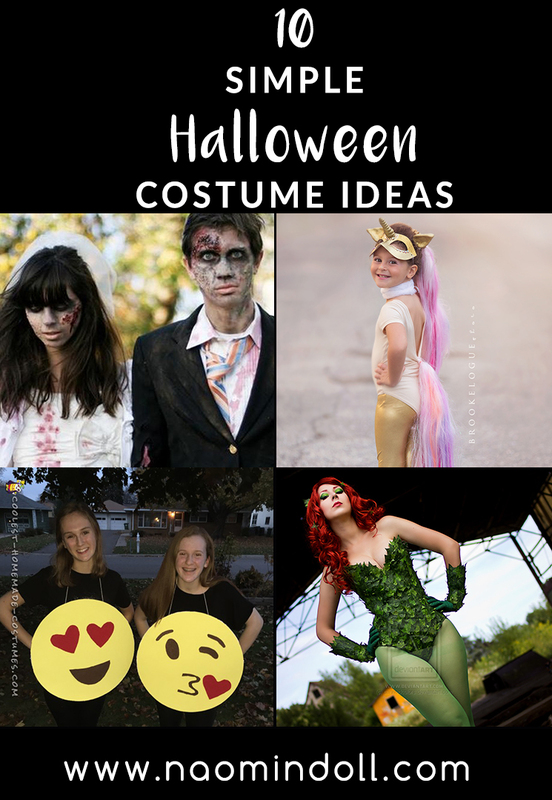 Great ideas for simple costumes! I love the unicorn costume. So cute!